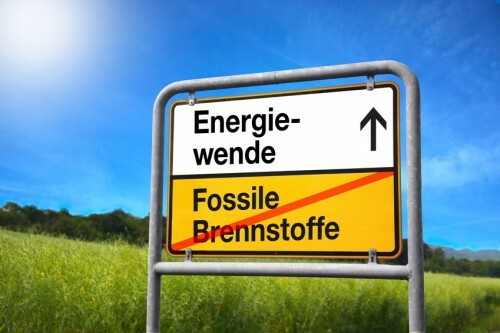 The idea of the energy transition ("energiewende" in German) originated in the 1980s and gained legislative support in Germany in 2010. The idea is good and also technically feasible. But it requires sacrifices and, at present, sacrifices are politically unthinkable since most people don't realize how critical the situation really is. What we are doing for the transition seems to be is too little and too late. So, how are we doing with the energy transition? Can we eliminate fossil fuels from the world's energy system? Can we do it before it is too late to avoid the disasters that climate change and resource depletion will bring to us if we continue with business as usual? The debate is ongoing and it sometimes it goes out of control as in the case of the controversy between the group of Professor Jacobsen at and that of Professor Clack which even generated a lawsuit for slander. In general, the debate is based on qualitative considerations: on one side we see plenty of naive optimism ("let's go solar, rah, rah! "), on the other, we have pure statements of disbelief ("renewables will never be able to do this or to do that."). But science is based on quantitative evaluations and we have plenty of data that should permit us to do better than play the game of the clash of absolutes. This is what we did, myself and my coworker Sgouris Sgouridis, in a paper that was recently published on "Biophysical Economics and Resource Quality," titled "In Support of a Physics-Based Energy Transition Planning: Sowing Our Future Energy Needs"
In our paper, we started from the Jacobson/Clack controversy and we tried to use physical considerations (not subjected to the vagaries of markets) to examine how fast we can grow renewable energy. That's constrained by several factors but, as a first consideration by the fact that we need to invest energy now in order to get energy in the future. This is why we refer to "sowing" in the title of the paper: every farmer knows that one needs to save some of the current harvest as seed for the future one - enough for eating in the future, but not so much that one would starve. In the case of energy, it is the same. We need to invest some fossil energy for the future harvest of renewable energy, but not so much that society would collapse (it is the "Sower's Strategy"). With these calculations, we show that physical factors provide fundamental insight on the challenge that humankind faces: the energy transition will be neither easy nor impossible, but it will require a substantially larger rate of energy investment than the currently allocated one. In short, a transition that could maintain the "BAU" (business as usual) is technically feasible and physically possible if we were willing to increase of a factor of 5 (at the very least) our investments in it. Unfortunately, the trend is going in the opposite direction. 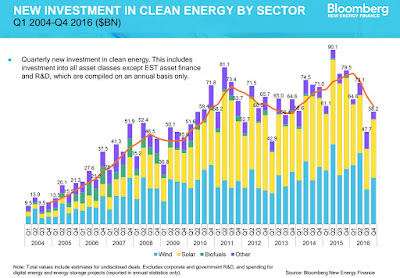 The global investments in renewable energy seem to have levelled off and In 2016 were approximately at the same level as they were in 2010. Too little, too late. Can we hope for some miracle that would increase the efficiency of clean energy technologies by a factor of 5 in a short time? Unlikely, to say the least. That's true also for the often idolized nuclear energy which is not more efficient than renewables in terms of EPBT and even more unlikely to go through rapid and revolutionary technological improvements. So, basically, we are not making it. We are consciously choosing to go down the Seneca Cliff, even though we wouldn't need to. It is maddening to think that we are failing at the challenge not because the transition is technologically unfeasible or unaffordable, but because the transition is politically inconceivable. Increasing investments in renewable energy requires sacrifices and this is a no-no in our world. So, what's going to happen? The fact that we won't attain the transition doesn't mean returning to Middle Ages or even to Olduvai, but that in the future not everyone, and not even a majority of people, will have as much energy as we are used to having today. The sacrifices we refuse to make now will have to be made, and much larger, in the future. 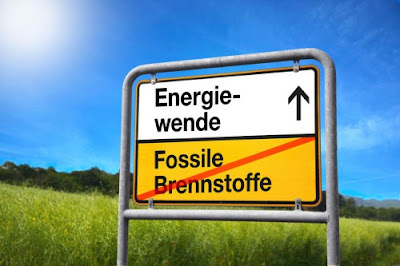 The legislative RE support in Germany started in 90., but the crucial point was the legal adaptation of the Renewable Energy Act (EEG) in the year 2000. You will be interested in this technology which we have developed. We call it BIOGEN after the geological name for the process used by Nature some 60 million years ago to convert algae and other organic material to WTI (West Texas Intermediate Crude oil. We think this is the fastest way to switch to sustainable fuel as it leaves in place the considerable technology of oil refineries and all other downstream technologies our society has developed. "The most popular concept of this transition involves a substitution of renewables for fossil fuels and development of elusive tail-pipe technologies like carbon-capture and storage. This concept is comforting and simple. But it is also profoundly wrong. There is no way to achieve an energy transition without completely reworking every aspect of our infrastructure, industry and economy to vastly reduce energy demand." There is also an interesting article here from Arstechnica saying the amount of materials we'd need for such a transition probably don't exist. "The analysis suggests we might not be able to. We'd need 90 percent of the global production of iron in 2011 just to build out renewables at the required pace (iron mostly going to wind and concentrated solar production). We'd need 150 percent of 2011's aluminum production and a staggering 200 percent of its copper (mostly used in photovoltaics). Could we do this? Probably, but it would be tough for copper. The researchers suggest that it might require tapping into lower-quality ores, which might have additional environmental impacts." Trevor, thanks. The second link had some good info. >Increasing investments in renewable energy requires sacrifices and this is a no-no in our world. Increasing investments could have been possible in better times, like before the GFC, say 1980s or 1990s, or even earlier. The pie was still growing, so increasing renewables was politically feasible. Now that the pie is not growing anymore, we cannot invest in renewables. We would have angry mobs across Europe and the US, and military coups would revert the changes anyway. A growing economy, and at least a prospect for a better future, is what post-war social peace was founded on. You do away with that and you are back in 1848: people hate industrialization, hate the status quo, see no advantage for them, and will revolt or sabotage the ship until it sinks. Take away the iPads and the social contract evaporates. Talk to your local MP. Thanks to Ugo and others, the necessary amount of investment can be moulded into two numbers: 3 % of energy production, 1 % of national product. Everybody can now see at a glance, whether or not things go right. We make those numbers as well-known as the famous 2 °C! we are only capable of unconscious collective effort---the sort of effort of which we remain unaware until the result of that effort becomes clear---then we collectively nod and agree that we did whatever it was, because we chose to. thus we will not accept any form of change that deflects from bau, even though change will be forced upon us. this change will force us into a new way of life and living, and in a century or so, we will look back and agree that we made those changes of our own free will. Norman, that's a pretty good summation of the human enterprise. (1) You talk about investment in renewable energy in terms of energy but then show a figure in monetary terms. This could be misleading since the decrease in costs of renewable technologies have led to an increase in installed capacities at lower investment levels. 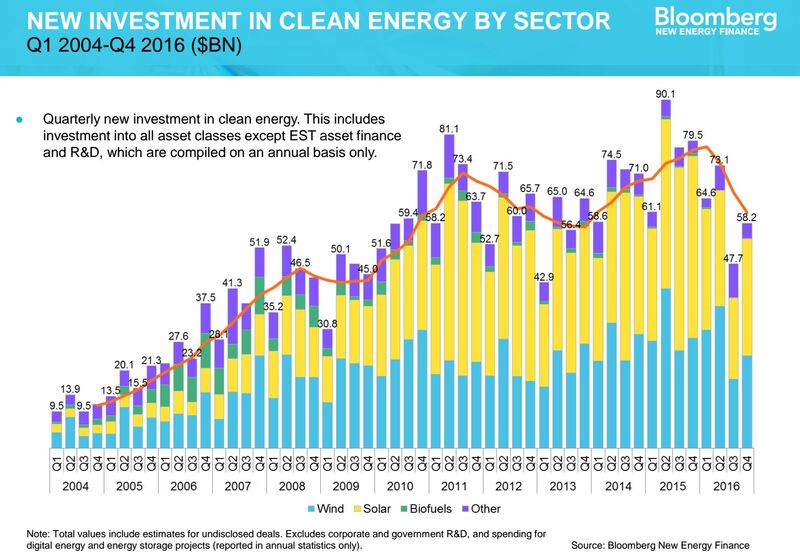 From the source you cite: "While overall global clean energy investment was down last year, it’s important to note that the total capacity installed was not. BNEF found a record 70 gigawatts of solar were added around the world last year, up from 56 gigawatts in 2015. Global wind energy deployments totaled 56.5 gigawatts, according to BNEF, which is down from 63 gigawatts in 2015, but still the second-highest figure ever." Investment (money) may have levelled off, but installed capacity has not. (2) When you discuss the EPBT and then mention GW, I assume you are referring to GW per year (as an energy measure) and not power (?). Yes, it is power installed per year in GW. And, indeed, the cost of renewable energy is still going down. In our opinion, this is a temporary factor, since the main technologies in use are mature and their efficiency is not subjected to further large improvements. interesting post. I wonder a bit over the "energy demand" of 2000 W per person a year. Shouldn't energy demand be expressed in Wh,kWh or other similar unit? It is an average power, so it can be expressed in W.
You say. "According to these estimates, the current level of energy investments in new renewable energy is not sufficient to attain the transition within the assumed climatic and energetic constraints." I wonder if you could flesh out what you mean by "energetic contraints"? Are you about a peak and decline of fossil fuels? When would this occur? What estimates are you relying on? epbt of solar in Germany: 2.7 y, in Sicily: 1.3 y. Yes, if we could place all the PV in Sicily, we'd be better off, but still wouldn't be enough. Thanks! Looking back through the papers and the apendix , it appears the model uses an oil peak date of 2009, which does not appear to be the case. It refers to Steve Mohr's PhD thesis. Mohr offers of literature review and three models, which seem to have a large range, between 2001 and 2101! But in his conclusion seems to be that conventional oil will peak by 2017, but unconventional is unclear. I wonder how sensation your model is to these dates? Thanks. I'm very curious about the possibility of an"energy trap". Is that how see it playing out? Depends on what you mean for "energy trap". For several decades prior to the net energy peak, energy availability is increasing and slowly plateauing creating an institutionalized expectation that it will continue to behave this way. The pace of market-driven ER investment is accelerating but it proves insufficient to compensate for the reduction following the fossil fuel (actual or climate-constrained) peak. With insufficient renewables built before peaking, the only option for maintaining energy availability post-peak is to raise the investment ratio ε – an action that further reduces the net available energy at the time of such investment2. In practice, raising the investment ratio ε after the fact is may be too costly as it effectively increases the perceived energy costs for the entire economy to socially unacceptable levels. A more likely result is a reinforcing cycle of demand destruction (due to high energy costs) and a drop in actual energy investment since, in a situation of dwindling resources, satisfying immediate needs becomes a priority thus diminishing the ability and willingness to invest in renewable resource infrastructure construction. This is the energy trap: the non-renewable resources are allowed to deplete without commensurate investment in renewable resources locking in a lower energy availability state, the scenario shown in Figure 1. "The debate is ongoing and it sometimes it goes out of control as in the case of the controversy between the group of Professor Jacobsen at and that of Professor Clack which even generated a lawsuit for slander. " The harsh reality is that it is not possible to run global, growth based industrial civilization on renewable energy, and its not possible to keep even a fraction of 7.5 billion people alive without industrial agriculture run on fossil fuels, let alone the way its exponentially growing. To imagine either is to vastly underestimate both the size of the human population and the energy contained in fossil fuels compared to alternative energy sources, which appear to be little more than 'fossil fuel dependents', without the remotest chance they could be scaled up to necessary levels, with the constant necessary annual growth on top. This debate is very like the debate between creationism and science. As Richard Dawkins correctly says about the foolishness of agnostically taking the middle ground on the issue; "one side might just be flat out wrong!". Being negative about alternative energy does not make me a supporter of fossil fuels. Far from it. I'm cynical because it is not the answer. It would not be popular with the mainstream if it was the answer! Its the stock answer for everybody because its an excuse to close down debate. It is the socially acceptable ALTERNATIVE to the drastic changes in human behaviour and living arrangements, such as end to capitalism, banning cars and travel, a zero child policy and other major strategies that might make an alternative energy transition work. The concept of Alternative Energy is an avoidance tactic rolled out as an excuse so humans can carry on without making any changes at all. I'm affraid you may be uncomfortably close to the truth. As an aside, capitalism is often tossed in with the usual suspects, but I'm not sure people are really aware of what it is or its role in the story. 1. Population isn't increasing exponentially anymore. Birth rates are well on their way to 2 per woman almost everywhere. Yes, there will be still a lot of new babies, because there are so many young women with no children. 2. I don't any reason, why the economy shouldn't be able to adapt a non-growth mode. This is (IMO) a big unquestioned urban myth. Capitalism can adapt to everything. What is growth? Basically an increase in efficiency of human work. This has meant the use of more energy in the past, but it can as well mean the more intelligent use of given energy. What do we need growth for? Basically to keep all people working full time. With innovation beeing kind of a constant, less growth means more people looking for a new employment. So, yes, there will be more people having to change their work, but this can be softened by state measures and is by no means a catastrophe. Economy has existed for thousands of years without noteworthy growth. It can do it again. you are forgetting people have died 'en mass' throughout history, even though populations tended to be relatively tiny and sustainable compared with today, as well as discontinuous economically. the past has never been exactly rosy in terms of die offs. but it didn't matter too much in the long term because the die offs tended to be regional, not global, allowing other human populations to continue to thrive. the big difference today is all human populations are economically connected and are universally in colossal overshoot and are entirely dependent on a teeteringly massive, and very tenuous, fossil fueled economy with almost zero redundancy in it. when one part of the global system fails, its likely the whole lot will go, and then most people will inevitably die. humans that survive this are likely to be mopped up by the global warming we have set in motion that is going to make the planet uninhabitable for large animals in the coming centuries. i dont think the fact that the human population has stopped increasing mathematically exponentially is any reason for complacency when its its still increasing nearly exponentially, and its about 15 times in overshoot already! and that the finite energy that supports it is going to be declining increasingly rapidly from now on too. we are now entering uncharted territory. but we can make educated predictions about what will happen. the human population has precisely followed a very typical animal plague growth curve, and so there is every reason to expect a typical die off curve to follow. andy, thank you for your post. Please allow me two brief comments. First, I did some population growth modelling for the city of Kano, many, many years ago. My analysis showed that it made almost no difference if some subset of people chose to limit their growth rate. They would simply be outbred by the others, and in only two generations become statistically insignificant. I believe history has proven this analysis correct. Secondly, and rather more recently, I made an estimate of the optimum human population in a fully sustainable world. I took as basis the two largest, long-term sustainable societies in history, mediaeval Europe and Edo Japan. The numbers that came up are about 1.2 billion maximum, in conditions of permaent dire poverty with full exploitation of all marginal land, and 600 million in reasonable enough comfort to product music, poetry, drama &c - in other words, to remain human. I stand by those numbers. Just need to add blockchain technology to renewables, smartgrids and CaaS. Surely this will attract global investments. Diverting that energy toward Bitcoin mining makes better sense. . .
Maybe, as a reality check - folks should read Vaclav Smil's (uni of Manitoba) essays on energy density. It make the reason why we cannot support our current industrial society on renewable energy abundantly clear. Reactions that I have had to his studies - is that he's a shill for the fossil fuel lobby - he isn't - he is just stating the plain and unpalatable facts of physics as they apply to energy supply. I live and run a small research station on PV - and well understand its limitations. Book Review: Food Scarcity. Unavoidable by 2100?